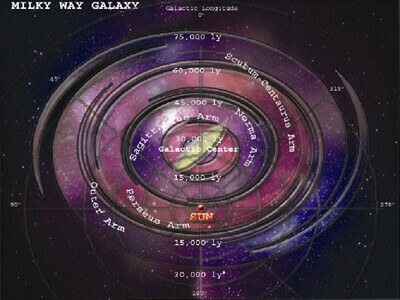 When we observe certain parts of galaxies, we observe what has come to be known as the spiral arms of the galaxy. These spiral arms rotate about the galaxy at different speeds, depending on their position within that galaxy. The stars of our own galaxy, the Milky Way, also rotate about the galactic center at different speeds. The inner stars rotate faster than the outer stars, yet they all are grouped according to their location within a distance spiral arm. The observed rotational speeds are so fast and diverse, it has been calculated that that if our galaxy were more than a few hundred million years old, it would have become, by now, a featureless disc of stars. Yet we find today that it is still in its spiral shape. According to evolutionists, our galaxy is supposed to be at least 10 billion years old, but now there is no account as to why the stars have not been uniformly and evenly distributed throughout our galaxy. Evolutionists have called this problem the “the winding-up dilemma,” and has been known about for over fifty years. It is called the ‘wind up dilemma’, because some natural force needs to be accounted for that would ‘wind up’ the galaxy to a pre-existing condition, namely, continually revert the star distribution back into spiral arm ‘groups’. Many evolutionists have devised different theories in attempt to explain it, each one only to fail over time due to the fact there is no natural force that could prevent the stars from becoming evenly distributed throughout our galaxy. This same “winding-up” dilemma also applies to other galaxies that retain their spirals. For the last few decades the favored attempt to resolve the puzzle has been a complex theory called “density waves.”The theory has conceptual problems, has to be arbitrarily and very finely tuned, and has been called into serious question by the Hubble Space Telescope’s discovery of very detailed spiral structure in the central hub of the “Whirlpool” galaxy, M51.